WITH A LITTLE PATIENCE, you can create a patch of bluebonnets in your own yard, ranch or roadside. Although this beautiful wildflower can be found across Texas every spring, bluebonnets can be tricky to get established. It may take several years to establish a good stand of bluebonnets and they do require some particular conditions to thrive. But once they are going, your bluebonnets should reseed and reappear each spring. 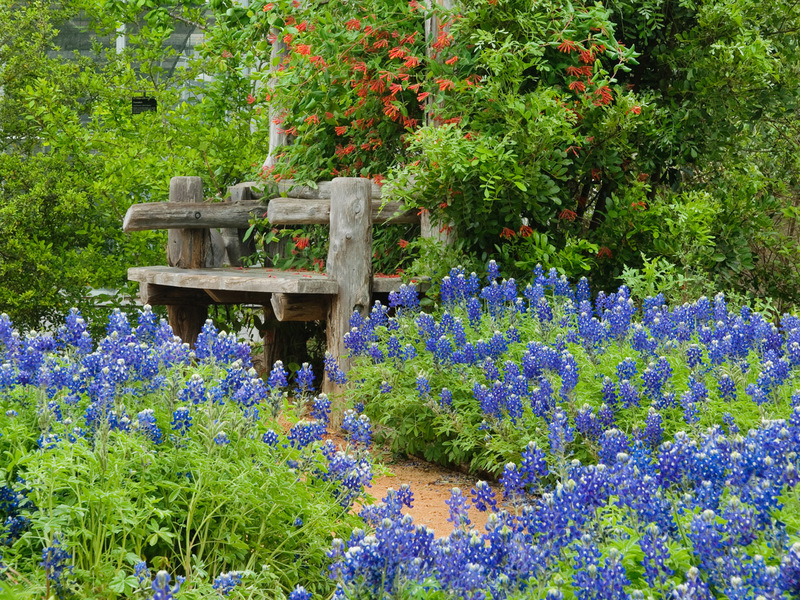 Bench surrounded with bluebonnets in the Wildflower Center’s Pollinator Habitat Garden. When Do I Sow Seeds? Plant the seeds in October and November (early October is best). Texas bluebonnets are annual plants, meaning they go from seed to flower to seed in one year. They germinate in the fall and grow throughout the winter, and usually bloom around the end of March to the mid-May. Around mid-May, they form a seedpod, which is green at first but turns yellow and then brown. Sometime between the yellow and brown form of the seedpod, the seeds mature. The seedpods pop open, releasing small, hard seeds. Texas bluebonnets are adapted to the rocky, alkaline soils of the Hill Country – and to its frequent droughts. In fact, they thrive in heavily disturbed, poor soils. Texas bluebonnets produce large, hard-coated seeds that may cause them to have a low germination rate the first year or two. This is nature’s “insurance” so that, in case of drought, residual seeds are left in the soil for the following year. As the hard seed coats wear down from abrasion and decay, with some water the seedlings begin to sprout. While that hard seed coat is an excellent mechanism for survival during unfavorable years, it can frustrate the gardener who wants a spring display of colorful blooms the first year after planting. Adding to a gardener’s frustration, not all seedlings that germinate successfully establish and grow to maturity. But don’t despair. Over the years, researchers and gardeners have figured out how to propagate and cultivate bluebonnets. To increase bluebonnet germination rate, scarify the seeds. Scarification means scratching or nicking the seed coats to simulate natural weathering processes. Once scarified, most seeds will germinate quickly and should be watered for several weeks, especially if the weather is dry. It is not recommended to scarify bluebonnet seeds that will not be receiving water during dry periods in the winter and early spring. Scarifying stimulates all of the seeds to germinate and does not leave residual seeds for subsequent years in the event of a drought. In addition, scarification can damage some seeds. It increases the number of seeds vulnerable to extreme weather conditions and disease causing organisms. Like most legumes, the roots of bluebonnets work in association with a bacterium called Rhizobium which improves plant growth and flowering. 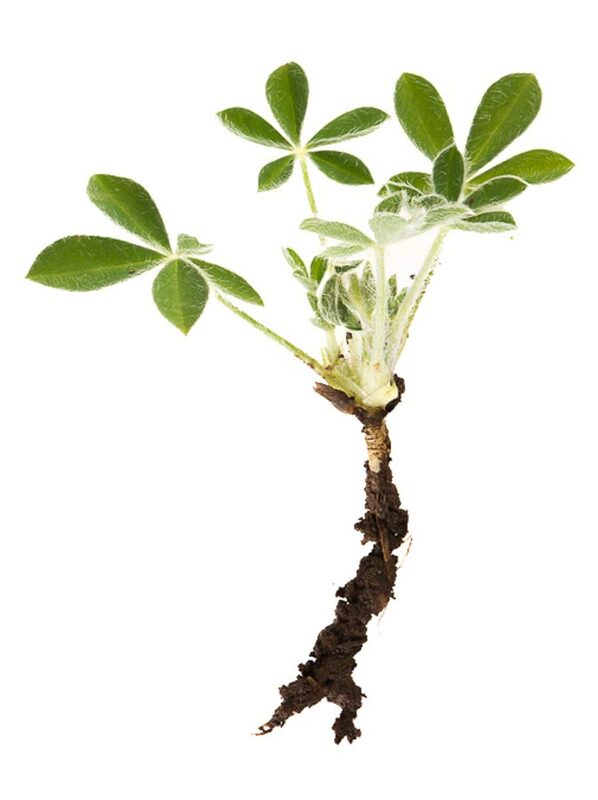 Rhizobium allows for nitrogen fixation, the conversion of atmospheric nitrogen to a form usable by plants. At the Wildflower Center, we’ve learned that sowing them directly in decomposed granite has the best success. Many Texas natives can handle some shade. This isn’t one of them. Bluebonnets are early bloomers and do best without being crowded out by other plants. Got questions? He’s got the answer. The Texas Department of Highways and Public Transportation recommends a seeding rate of 10 to 12 pounds per acre. At that rate, an ounce (which contains between 850 and 1,000 seeds) will cover about 200 square feet. This is approximately five seeds per square foot. Using that rate, maximum display probably would be reached the second or third year after planting. If cost is not a consideration, your area is small or you want a good display quickly, seed companies recommend using 8 to 10 seeds per square foot. At that rate an ounce will cover approximately 135 square feet, and half a pound covers 1,000 square feet. Choose a sunny, well-drained location with slightly alkaline soil for Lupinus texensis. South and west-facing slopes will encourage earlier spring growth and flowering. L. subcarnosus, which prefers the sandy soils found in areas of East Texas, is also available commercially in limited amounts and also requires a sunny, well-drained site. If your site is not weedy and you plan only to interseed bluebonnets into existing vegetation, the process is relatively easy. Mow the vegetation to 6-8 inches and rake up the thatch. Try to open up some bare areas to allow the seeds to make contact with the soil. Prepare weedy ground by using the techniques outlined in Soil Preparation in Gardening and Landscaping with Native Plants. For bare ground, plant seeds on a lightly tilled or slightly roughened soil surface for optimum seed-soil contact. One rule applies to all wildflower planting, good seed-soil contact is essential. Contact with the soil helps retain moisture around the seeds, which is necessary for germination, and provides a substrate for seedling growth. Hand broadcasting is the simplest seeding method and works well. You may dilute the seeds by mixing them with sand to easily achieve even coverage. Press seeds firmly into the ground with your hands or walk over the area. Water your bluebonnets, if possible, using light, well-spaced waterings. Although bluebonnets require some moisture to germinate and grow, they do not like saturated soil. If fall or winter rainfall is low, an occasional watering will help ensure success. As a general rule, you do not need to fertilize. L. texensis because it is adapted to alkaline soils that can be low in nutrients, perhaps because of the presence of Rhizobium. Fertilizing is not recommended and may encourage leggy and weak plants with more leaves than flowers. However, if your seedlings do not appear to be growing vigorously, they may needRhizobium, or you may want to fertilize lightly in early spring. 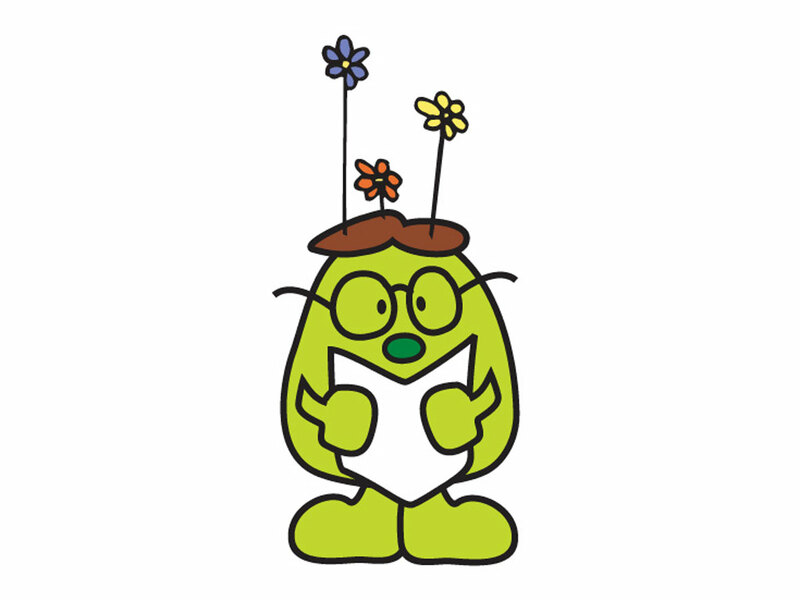 Do not mow until the plants have formed mature seedpods. Bluebonnet seeds usually mature six to eight weeks after flowering. When mature, the pods turn yellow or brown and start to dry. By mowing after the seeds have matured, you will allow the plants to reseed for next year.